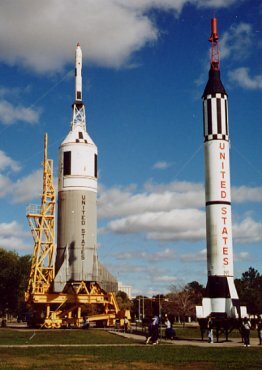 The Saturn V, Redstone, and Altas rockets are visible from NASA Road 1. As its name suggests, NASA Road 1 leads to NASA's Johnson Space Center in far southeast Houston. 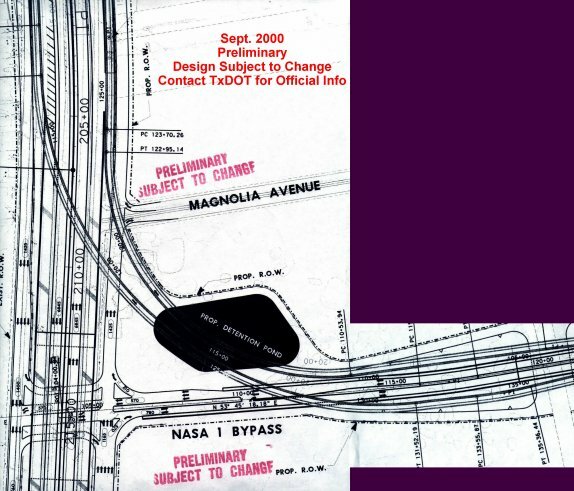 By 2003, the NASA 1 bypass should finally be under construction. It will be short - only about 2 miles long - but it should permanently solve the chronic traffic problems that afflict NASA Road 1 in the section just east of I-45. The freeway will have 4 lanes, no feeders, and a narrow right-of-way (45m = 147 ft). There will be two direct connectors at the I-45 interchange. It's been a painfully long wait for the improvements to NASA Road 1. Construction was set to start in 1989, but the City of Webster stalled in paying its 10% share of right-of-way and utility relocation costs, which amounted to $1.7 million. On May 2, 1992, Webster voters rejected bond money to pay for the project by a margin of 16 votes, putting the project on indefinite hold. See a news article from May 25, 1992, detailing the fallout. 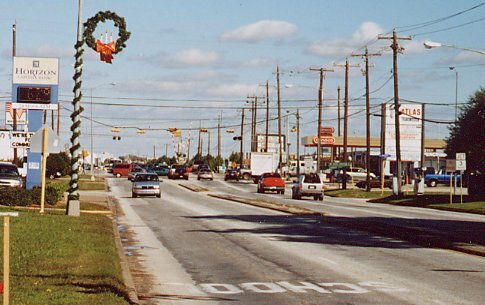 By 1994, TxDOT and the City of Webster agreed to build a bypass on the south side of the city. Public hearings were held in about 1996. The resulting design is a limited access freeway bypass with direct connectors to I-45. Construction is set to begin in December 2002, a 14-year delay from the original schedule. 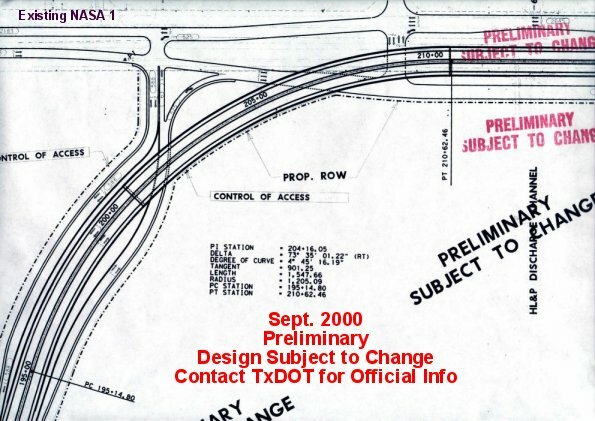 A TxDOT press release from September 18, 2000 gives more details. Projected construction start date is December 2002, but could be accelerated if right-of-way acquisition is completed sooner. Project construction cost will be about $32 million. NASA Road 1 at the intersection with State Highway 3. Between I-45 and Highway 3, NASA Road 1 is a four-lane undivided roadway on a very narrow right-of-way. NASA Road 1 near the eastern end of the bypass. This traffic light will be replaced with an overpass. The Manned Spaceflight Center (now the Johnson Space Center) becomes the focus of the Apollo moon landing effort. 1960's-1990's The Clear Lake City real estate development takes shape, increasing traffic pressure. The development was built-out by the mid 1990's. The critical stretch of NASA 1 between I-45 and TX3 remains in a rural configuration. 1989 Construction originally set to begin. 1992 On May 2, 1992, a $1.7 million bond issue to pay for right-of-way and utility relocation is defeated by 16 votes in Webster. 1994 The City of Webster agrees to a new location bypass south of the city on January 15, 1994. Mid 1990's Public hearings on the bypass route. Dec 2002 Projected letting of the contract for the NASA 1 bypass freeway. Estimated cost is $32 million. The NASA 1 bypass freeway at the I-45 intersection will have two direct connectors. Notice the wide I-45 bridge, with about half of the pavement area striped off. I-45 will be widened to 10 mainlanes and 2 HOV lanes at some point in the future (probably between 2005 and 2010), and the new bridge will be built wide enough for the future expansion. The eastern end of the bypass where the bypass freeway merges back with the existing NASA Road 1.